I am married to HRR Webmaster Matt Wilson. We have one son and two dogs. I am a librarian at Mount Juliet Christian Academy. I also coach Air Rifle and I am a Red Advance Belt in taekwondo. 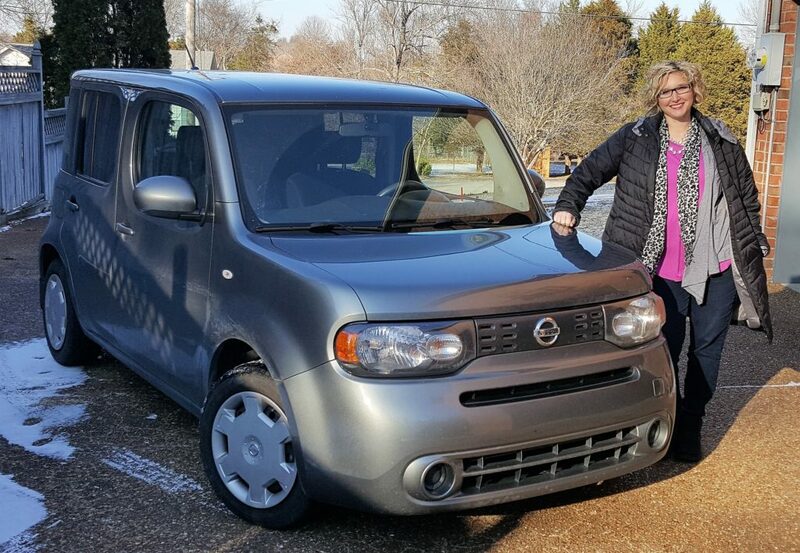 We own several vehicles, but I consider them my husband’s as I only drive two on a regular basis: the 1996 Nissan truck and the 2011 Nissan Cube, which is my daily driver. Not everyone is a fan of the Cube, but I l.o.v.e. my Cube! I can fit anything inside of it. It sits up high. The cup holders are awesome! It turns on a dime. It gets excellent gas mileage. We also recently purchased my dream car: a 1988 Nissan Pulsar NX SE. It’s my husband’s next fixer-upper. I’m looking forward to cruising around with the T-tops off, a ’90s playlist going, and trying to figure out how to manage a Sonic Route 44 Diet Coke without a cup holder. Ugh! This is hard. The ’71 LeMans was the car that brought me home from the hospital and 16 years later I learned how to drive a stick shift in it. The late ’80s Ford Ranger truck was the first vehicle I drove solo in. The ’90 Nissan Sentra was MY first car. My 2011 Nissan Cube turns on a dime. But my favorite car from the list is my 1988 Pulsar. It was time for me to take my driving test and get my driver’s license. I had shared with my parents that my other 16-year-old friends had not been allowed to drive a car solo at least a week after they had received their licenses. So I had asked to get to drive alone on the very day I received my license. My parents kept saying, “We’ll see.” The day I passed my driving test and received my license, my dad let me drive him home. We were in the late ’80s Ford Ranger pick up truck. We pulled into the driveway and my dad said to just let him hop out. I was confused; we were home, why wasn’t I pulling into the garage? My dad got out of the passenger seat, pulled a $20 from his pocket and said, “Now go out and get me a Captain’s Platter at Captain D’s.” This was significant because 1. We had to pass the Captain D’s on the way home; 2. My dad trusted me enough to let me go out alone in less than an hour from receiving my license; and 3. I got bragging rights with my friends! Let me share about my Pulsar: It was Thanksgiving 2017 and Matt and I were sitting with my father-in-law (Guy) in the living room. Matt said he was just about finished with his 1976 280Z and now it was time to buy me a car to fix up. Guy asked what I wanted and I proudly said a late ’80s or ’90 Nissan Pulsar. He gave the same response I get from everyone: disbelief. Out of all the cars that have ever been made, why would anyone want a Pulsar? This blonde does. Matt and I told him they were impossible to find and perhaps I should look at a Nissan 300Z. On Saturday, just two days later, I start getting texts from Matt: “When will you be home?” “Text me when you are on your way home.” “Are you on your way yet?” I got home and asked Matt what was so urgent. He flipped his laptop around and on the screen was a Craigslist ad for a 1988 Nissan Pulsar NX. I burst into tears and was finally able to say, “You’re dad found me one.” Up until that point, Matt said he wasn’t sure if I was serious about wanting a Pulsar. The car was mine the very next day.